A 15-year-old obese adolescent girl presents to the clinic with a 1-month history of near-daily, throbbing, early morning headaches and nausea. She is being bullied at school because of her weight and acne. Her medications include a combined oral contraceptive pill (OCP) and retinoic acid cream. Her mother thinks she is faking symptoms to stay home from school. Her vital signs and general, and neurologic exams are normal except for blurred optic disc margins. A. Tension headache due to social stressors. The correct answer is “C.” The early morning headache with nausea and papilledema on exam should clue you in to increased intracranial pressure as the underlying cause of the patient’s symptoms. 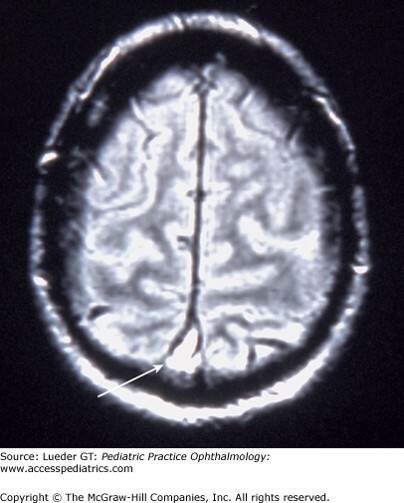 Although option “D,” acute hydrocephalus, could also cause these symptoms, the patient would likely present in a more emergent manner with vomiting, altered level of consciousness, and possibly focal neurologic findings. Idiopathic intracranial hypertension (IIH), also known as pseudotumor cerebri syndrome, can be truly “idiopathic”; however, it is also associated with obesity, pregnancy, endocrinopathies, medications (tetracyclines, retinoic acid), vitamin A toxicity, and anemia. Although the neurologic exam in affected children should otherwise be normal, cranial nerve (CN) VI palsy is allowed as it is a “false localizing sign” of increased intracranial pressure. Photo: Lueder GT. Pediatric Practice: Ophthalmology; 2011.